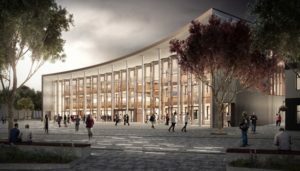 In 2015, the University of Central Lancashire (UCLan) announced its intention to create historic and transformational change at its Preston Campus through a £200 million Campus Masterplan development. The delivery of the first phase will include new buildings, green spaces, class-leading technologies and infrastructure. The new facilities will attract and retain new talent and create a cutting-edge environment that showcases UCLan’s key principles of openness, transparency and accessibility, whilst developing a skilled workforce which meets local, national and international needs. The University was determined that the first delivery from the Masterplan should substantially benefit existing students, which is why the new Social Spaces are the first new facilities that have been completed. Situated in the heart of campus, the Social Spaces provide areas for students and staff to work, socialise and relax. Following on from the Social Spaces, the University opened a bespoke, purpose-built multi-faith centre in Spring 2018. 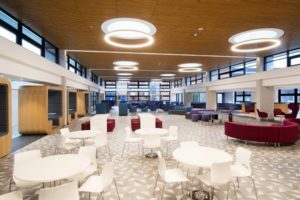 It was designed in consultation with staff, students and the Students’ Union to ensure the optimum utilisation of the space. The Oasis Faith and Spirituality Centre has seen an extension to the existing Moss building, which includes a dedicated Muslim prayer room, library, a chapel and a dedicated room for quiet reflection. There is also space for counselling, meetings and social gatherings, including a relaxing roof garden. The opening of the £32 million Engineering Innovation Centre (EIC) will be the next major milestone in the completion of the Campus Masterplan. 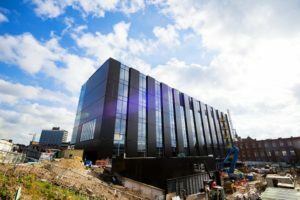 The EIC will be a state-of-the-art facility, with integrated teaching and research space, and will create an environment that inspires teaching, research and knowledge exchange, establishing UCLan as a leader in engineering innovation. We anticipate that the centre will produce an increase of hundreds of locally trained graduates per year in areas such as aerospace, mechanical and oil engineering. Finally, at the heart of the Campus Masterplan, a new Student Centre linked with a public square will draw together the University with the City like never before. Providing a home for the various student services at the University, the building will contain offices, meeting rooms, workstations and event venues including a roof garden. This investment will help staff to continue the outstanding support they provide for students and welcome local communities into the University. The long-term vision of UCLan’s Campus Masterplan is to spark a major focus on regeneration and business investment in the University quarter, reinforce the University’s ties to the local community and create wider benefits for Preston and beyond.